that leaves 44% of voters undecided - who will win these votes? The best evidence suggests that Republicans and Democrats are equally split with 28% of the decided vote each, that leaves 44% of voters undecided, leaning one way or the other, or who will not vote in November. For example, a small but significant ten-percent shift in the ethnic, female and independent vote could be a deciding factor in the election for the presidency as well as scores of senatorial and congressional races across the country. Winning over these voters will depend largely on who these voters are and the effort each candidate expends in reaching them. 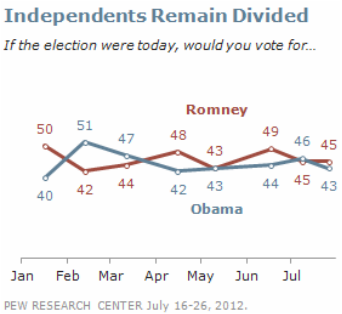 If Romney writes off any segment of that 44% in the swing states he diminishes his chances of winning. Does Romney's on the ground staff understand this? Evidence is that some do, and others don't have a clue. In a piece entitled 'NAACP tough sell for Romney' columnist Seth McLaughlin writes that Obama won 95 percent of the African American vote and 67 percent of the Hispanic vote in his 2008 winning campaign, and the working assumption is that he needs those same numbers to win re-election in 2012. Some professional analysts have calculated that the booing Romney received during his NAACP speech on the subject of health care reform, actually helped him with his core conservative supporters, by demonstrating his ability to stand firm on conservative principles. The fact that Romney received several standing ovations during that speech has gone unreported. Media reporting of the reaction of the predominately African American audience to the Romney speech is indicative of a basic misunderstanding of the division between conservative and liberal forces in the African American community on a range of issues. And, justifies a host of other unexamined views which will impact upon Romney's electability. All other factors considered, what emerges is that Romney will have to reach out to the working class, and it is precisely amongst the working class that Obama has lost his hold over voters. This group overwhelmingly voted for him in 2008, and it is the working class that has been severely impacted by the long-lingering downturn in our economy. Demographically, working class voters are women, ethnic minorities, and steadfast independents, and represent a large voting bloc that could push Romney and several Republican senatorial candidates into the winning column in states like Ohio, Wisconsin, Florida, and Pennsylvania. What Romney will have to do to win is capture some of these votes and if he does he will enhance his chances of reaching the White House. assumption of some high ranking members of Romney's electoral think-tank or ground game tacticians. They see a better strategy that suggests spending millions upon millions of dollars on negative anti-Obama ads. What this is supposed to accomplish is not making anyone feel better about Romney, but rather to depress a lot of undecided voters to stay home on Election Day, that is, they are betting on the art of running a negative campaign. From the effort being put on the ground, even in swing states like Ohio, it seems the negative campaigners have sway over the course of Romney's fortunes. It is a big gamble, and one to be re-examined on the 7th of November. To further illustrate the dramatic influence gender and ethnicity exert on presidential election outcomes, consider the result of the 2008 election when we observe votes cast by women only. In this scenario Obama won the election over McCain by a margin of 393 to 145. The actual count was 365 to 173. It is therefore reasonable to argue women decided the outcome of the presidential election. Excluding everyone other than male voters Obama won by a margin of 325 to 213 and, considering the votes of ethnic minorities only the margin was 538 to 0. And, here the exact influence of gender and ethnicity on the vote can be seen most dramatically, the combination of female and ethnic votes added 40 points to Obama's margin over the male only vote total of 325 to give Obama his 365 electoral votes. While at the same time they reduced the male only vote total for McCain by 40 electoral points from 213 to 173. The result was the 365 to 173 electoral votes by which Obama won the presidency. The demographics affecting the outcome of the 2008 presidential election cannot be illustrated more clearly than that. Therefore, a campaign strategy that is conducted on the assumption that you can discourage voters who are not going to vote for your candidate from voting at all and win, suggests that you can discourage a great number of female, ethnic and independent voters from going to the polls. And, to assume that one can formulate a plan to revive the voting pattern of the 2004 presidential election ignores certain demographic realities which are unavoidable, the most important of which is the fact that the voting population demographics of 2004 no longer exists. In final analysis, the evidence suggests that any strategy that does not include a major effort to sway women, ethnic and independent voters specifically in this presidential election campaign is potentially fatal. It is these voters who will decide the swing state outcomes. (Obama leads Romney 68% to 28%) and single women (Obama leads Romney 64% to 30%). The most pro-Romney group? Married men, among whom Romney leads Obama 53% to 42%. The Marquette surveys offer an unusual window into the dividing lines in the state of Wisconsin, because the Marquette polling includes – almost 6,000 interviews with registered voters this year. A sample this large provides much more reliable measures of smaller slices of the electorate, such as married men, or women under 30, frequent church-goers, or property owners as opposed to renters. The percentages represent all registered voters surveyed between January and July of 2012, a period in which Obama’s lead hasn’t changed significantly. The numbers may modestly overstate Obama’s support among November voters, since Democrats tend to do better in polls of registered voters than in surveys of likely voters. However, the main focus here is less about the extent of a Romney or Obama lead than with the social, demographic, and political fault lines in the race. Demographics such as gender, marital status and age show definite correlations within those currently registered to vote, such as, the fact that Obama is doing better with women (+8%) than with men in Wisconsin. But, that doesn’t tell the whole story, because there are big differences by age and marital status among both men and women. The 'marriage gap' is larger than the gender gap. Obama is doing better (+14%) with single women than married women. Single - in these polls include divorced, separated and widowed voters as well as those who have never married. The current president polls 16 points better than Romney with single men as opposed to married men. The age gap is also bigger than the gender gap. Obama is doing 14 points better with women under 30 than with women 60 and older. He is doing nine points better with men under 30 than with men 60 and over. Considering that age and marital status are often better predictors of voting behavior than gender is, Obama does better overall with women than men, he does better with men under 30 than with women 30 and over, and better with single men than married women. Short title: Can Romney Win? Long title: A winning strategy for Romney in the swing states of Ohio, Wisconsin, Florida, and Pennsylvania.